THROGS NECK, Bronx (WABC) -- Eight people suffered minor injuries when a school bus overturned on the southbound Cross Bronx Expressway in the Bronx Wednesday afternoon. The accident happened at 1 p.m. on the southbound side near East Tremont Avenue in the Throgs Neck section. According to a spokesman for Little Lisa Bus Company, the bus had just picked up five special needs students from P.S. 114 in the Bronx. 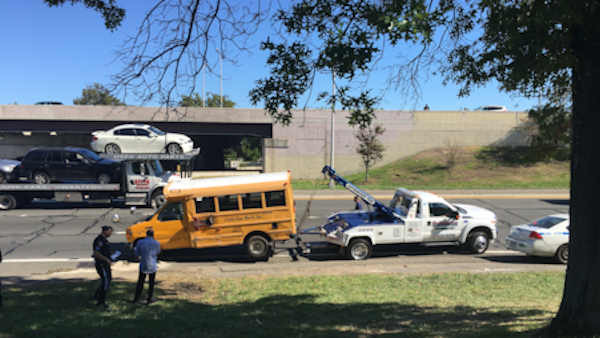 The bus was traveling southbound on the Cross Bronx when it was sideswiped by a black Camry. The bus overturned and landed on its side. Three adults - a teacher, matron and driver - and the five kids were taken to Jacobi Medical Center with minor injuries. Two lanes of the highway were closed after the accident.